"All bills for raising Revenue shall originate in the House of Representatives; but the Senate may propose or concur with Amendments as on other Bills." ~ Article I: Section 7 of the U.S. Constitution. The rest of the section spells out how a bill can be passed into law (think Schoolhouse Rock) and the recourse the legislative branch has when faced with a presidential veto. 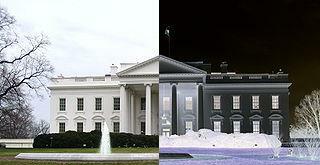 Subject: White House (altered by James Kiester) | Date: 02/29/2008 | Photographer: Okatah |This file is licensed under the Creative Commons Attribution 2.0 Generic license. MSNBC's Ali Velshi, "if the federal shutdown continues, it will likely cost more than the $5.7 billion President Trump wants for his border wall ." Velshi has a point. Keep in mind, it's not only 800,000 workers who are losing out right now. When those workers would go to lunch during their work day, they were buying that lunch from a business. That business has not been selling those lunches for four weeks now. When the 800,000 were working they were spending money in their communities. Now that they're having to cut back, all those businesses in that community suffer. The ripple effect is absolutely incalculable. It won't be long before corporate America starts to feel the effects on their bottom line. When that happens, stocks are going to take a dive. Having this many people taken out of the workforce for this long is a sure way to take a wrecking ball to our economy. I would argue that the cost is in more than just dollars. The American people are losing faith in their country. When our leaders cannot work together long enough to keep the proverbial doors open it makes our country look inept around the world. On Saturday, at 4:07pm EST, President Trump read his newest proposal to end the shutdown. He offered a three year extension on DACA in exchange for $5.7 billion for the down payment on his border wall. He wasn't off the air for one hot minute before Nancy Pelosi was on air rejecting the offer. Trump made an offer that he knew Pelosi would not accept. Pelosi did not even pretend to think it over before she said no. Both sides are so intent on winning that there's no room for give and take. Without a willingness to negotiate our government cannot function. As I see it, there's only one semi-realistic way out of this mess. I've said it before, and I'll say it again, Majority Leader Mitch McConnell needs to allow the Senate to vote on the bills which have gone through the House. Once the president vetoes the bill, Congress needs to override the veto and get America back to work. However, in order for this to happen, the Republican controlled Senate needs to start acting like part of the legislative branch of government, rather than an office of the White House.